During Harvey and Irma, six holdovers from a dying reactor industry--two on the Gulf Coast at South Texas, two at Key Largo and two more north of Miami at Port St. Lucie--were under severe threat of catastrophic failure. All of them rely on off-site power systems that were extremely vulnerable throughout the storms. At St. Lucie Unit One, an NRC official reported a salt buildup on electrical equipment requiring a power downgrade in the midst of the storm. Four of six Fukushima Daichi reactors suffered hydrogen explosions, releasing radioactive fallout far in excess of what came down after Hiroshima and Nagasaki. Extreme danger still surrounds Fukushima's highly radioactive fuel pools, which are in varied stages of ruin. "In addition to reactors, which at least are within containment structures, high-level radioactive waste storage pools are not within containment, and are also mega-catastrophes waiting to happen, as in the event of a natural disaster like a hurricane," says Kevin Kamps of the activist group Beyond Nuclear. In 1992 Hurricane Andrew paralyzed fire protection systems at Florida's Turkey Point and so severely damaged a 350-foot-high tower it had to be demolished. The eye of that storm went directly over the reactor, sweeping away support buildings valued at $100 million or more. There's no reason to rule out a future storm negating fire protection systems, flinging airborne debris into critical support buildings, killing off-site backup power, and more. Viable evacuation plans are a legal requirement for continued reactor operation. But such planning has been a major bone of contention, prompting prolonged court battles at Seabrook, New Hampshire, and playing a critical role in the shutdown of the Shoreham reactor on Long Island. After a 1986 earthquake damaged the Perry reactor in Ohio, then-Governor Richard Celeste sued to delay issuance of the plant's operating license. A state commission later concluded evacuation during a disaster there was not possible. 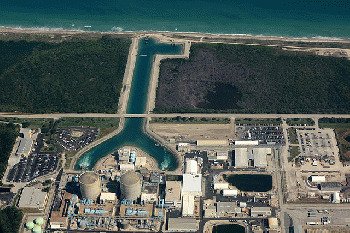 After Andrew, nuclear opponents like Greenpeace questioned the right of the plant to continue operating in light of what could occur during a hurricane.